Maybe it’s a leftover byproduct of attending the local 3/8ths mile paved oval racing when I was a kid, but I have a strong feeling that real racing happens at night. Tracks lit up under the glow of thousands of lights look more exciting, and the cars look an order of magnitude prettier. Everything looks a little closer, and the universe feels a little farther away. And on the plus side, it’s not as hot at night for the people attending. Formula One’s annual run at Bahrain under the lights is a spectacle to behold. Just watch this gorgeous onboard from Charles Leclerc’s pole lap yesterday, and you’ll see what I mean. The thousands of light poles, both on the track and around it, make the Ferrari feel like it’s part of a Star Wars film, jumping from system to system with the bright lights of thousands of distant suns streaking by. 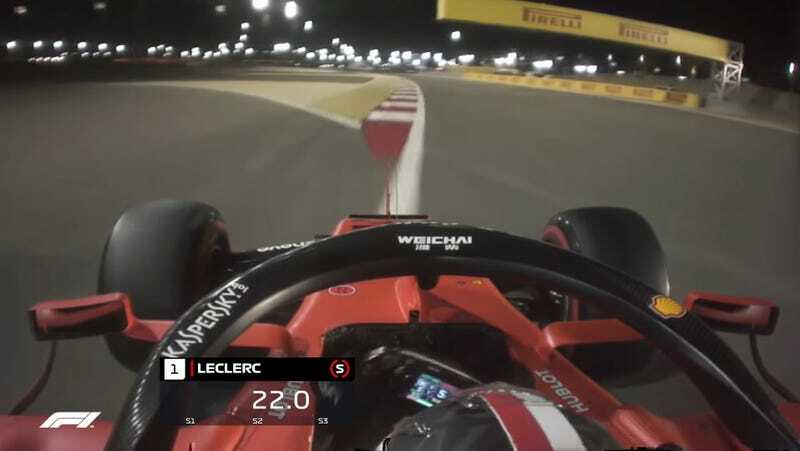 Leclerc’s seriously dominant sector 1 is what got him the pole position and the all-time lap record for the Bahrain circuit. Nabbing a personal best in sector two improved upon his prior lap. The Ferrari is quick at this track, and I’m looking forward to seeing how he does in the race. No pressure, kid.